As thousands of low-wage workers and allies demonstrate this week for a $15 per hour minimum wage, SEIU Healthcare Minnesota members at Allina Hospitals ratified a new three-year contract that establishes a $15 per hour minimum wage for the first time for workers at seven hospitals across the Twin Cities region, including in Shakopee and Buffalo. The contract provides employment security protections as well as additional health and safety protections for workers. It includes a wage increase in every year of the contract for all members, an increase in Allina’s contribution towards the members’ pension plan, and a 25 percent increase in the amount of tuition reimbursement available to all members annually. The new agreement also takes a significant step towards equal pay for equal work for workers at Allina hospitals outside the metro region, the union said. Coming on the heels of a new contract for 3,000 hospital workers at eight other Twin Cities hospitals – including Children’s Hospitals and Clinics, Fairview Health Services, HealthEast Care System, North Memorial Health Care, and Park Nicollet Health Services (recently merged into HealthPartners) – over 99.5 percent of the workers in 16 hospitals covered by these contracts will have a $15 per hour minimum compensation. More than 3,000 Allina hospital workers, including nursing assistants; environmental services staff; cooks and dietary staff; licensed practical nurses; X-ray, surgical and sterile processing technicians; and many others were working without a new contract after their last agreement expired on March 1. They work at eight Allina hospitals, including Abbott-Northwestern, Buffalo, Mercy, Owatonna, St. Francis, United, Unity, and Phillips Eye Institute. SEIU Healthcare Minnesota represents more than 43,000 healthcare and long term care workers in hospitals, clinics, nursing homes, and home care across Minnesota. 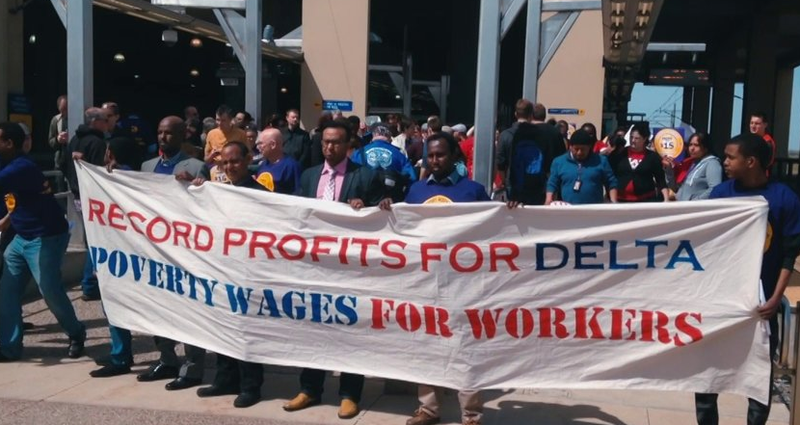 Airport workers joined a national day of protest asking companies that operate our of the Minneapolis/ Saint Paul International Airport to raise the minimum wage to $15 an hour. Organizers say that families cannot survive on less than that.